This image shows Miquelon and Saint Pierre Islands, located south of Newfoundland, Canada. These islands, along with five smaller islands, are a self-governing territory of France. North is in the top right corner of the image. The island of Miquelon, in the background, is divided by a thin barrier beach into Petite Miquelon on the left, and Grande Miquelon on the right. Saint Pierre Island is seen in the foreground. The maximum elevation of this land is 240 meters (787 feet). The land mass of the islands is about 242square kilometers (94 square miles) or 1.5 times the size of Washington, DC. This three-dimensional perspective view is one of several still photographs taken from a simulated flyover of the islands. It shows how elevation data collected by the Shuttle Radar Topography Mission (SRTM) can be used to enhance other satellite images. Color and natural shading are provided by a Landsat 7 image taken on September 7, 1999. 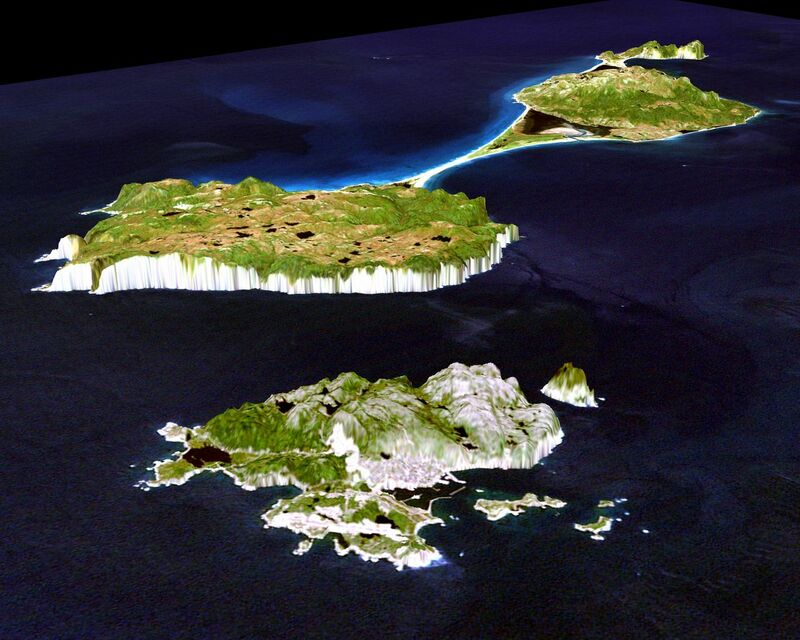 The Landsat image was draped over the SRTM data. 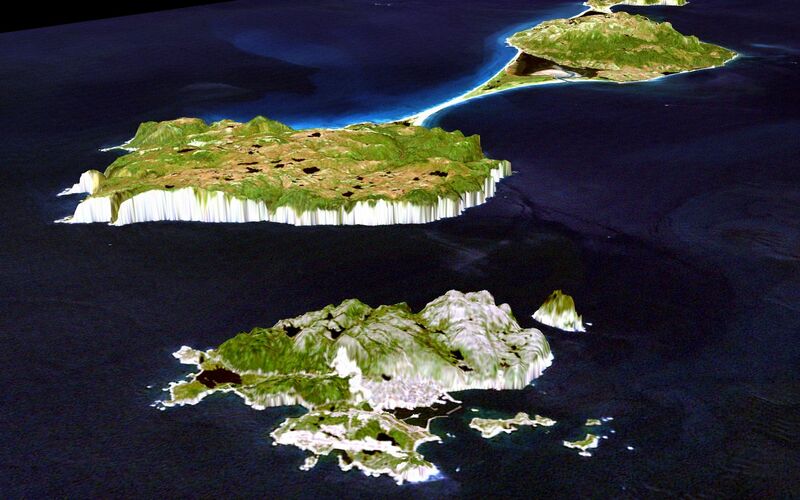 Terrain perspective and shading are from SRTM. The vertical scale has been increased six times to make it easier to see the small features. This also makes the sea cliffs around the edges of the islands look larger. In this view the capital city of Saint Pierre is seen as the bright area in the foreground of the island. The thin bright line seen in the water is a breakwater that offers some walled protection for the coastal city.